Muhammad Siyar was a nobleman from the village Shogram, in the main valley of Chitral. He lived during the latter half of the Eighteenth Century and the early years of the nineteenth century. Siyar travelled far and wide in search of knowledge, and was the most learned man of his time in Chitral. He wrote Persian poetry characterized by “spiritual romanticism” in the style of Hafiz Sherazi, preserved in a book named “Diwan e Siyar”. He also wrote an epic glorifying the history of Chitral. 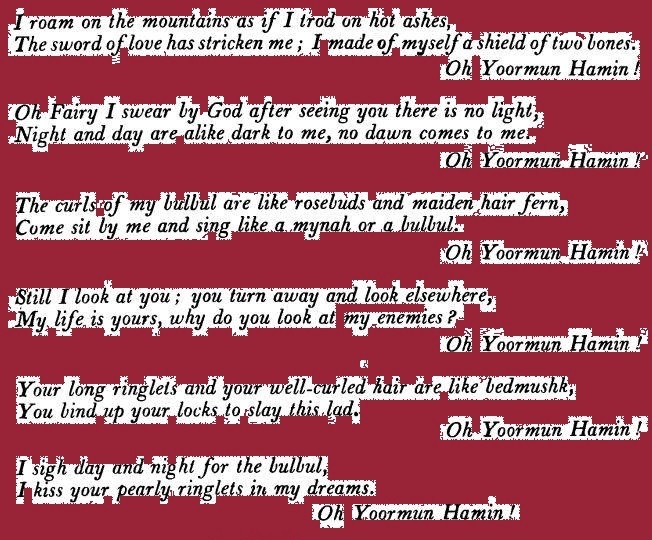 But what he is mostly remembered for is the long Khowar song “Yarman Hamin”, which he is said to have composed for his beloved living in Reshun village, across the river. Siyar’s love story is the most romantic one among the folk tales of the region, which also has been enacted and telecast by Pakistan Television. Literati, researchers and academician believe that his poetry was largely touched by love for divinity (ishq-e-haqiqi) exemplified through material instances (ishq-e-majazi), such as ‘beloved’ ‘red-colored soil’, rose-bud lips, ‘bowl’, ‘dance’ and so on. He seems to have used inductive method—moving from specific observations material existence (majaz) to strengthen belief in divinity and its broader generalizations. Dispensing with shroud, I would have loved it to dance. Inspires the queenly look-furthering pain and sufferance. What a charming manner of holding bowl and taking it! O Siyar! My heart dislodged and fell into stomach’s pit. So as ache of sweet heart and its sensation could be read. I cried, shed tear but went on, crediting to thy engaging feat. O God! T’s the miracle of thy creation shaping such beauty. Thus preferring soul’s flight to eternal peace and relief. Alas! Premier age’s gone, the grief of senility hover. O my fairy! To thee I say: ‘Siyar’s pain beyond endurance. Mine is wretched since surrendered to thy love so keen. To enliven my love for her and the world that I crave. To thee bouquet I’ll share, with rose petal pelt me and tease. Better not feel sorry since wedding and servitude. A Website on the Culture, History and Languages of Chitral.